People like Donald Trump are engaging in the kind of reckless demagoguery that only encourages discrimination and violence against our Muslim neighbors. Instead of fearing them—or menacing them with AR-15s outside their mosques—we should be thankful that American Muslims are as successful and well-integrated into our society as they are. That may seem counterintuitive in the wake of a horrific terror attack by Islamic extremists, but the reality is that terrorism in the United States is exceedingly rare, and there’s no evidence that American Muslims embrace extreme views at a higher rate than Christians or Jews. There’s a common view that there exists a “Muslim culture,” and that it’s defined by religious leaders in the Middle East. 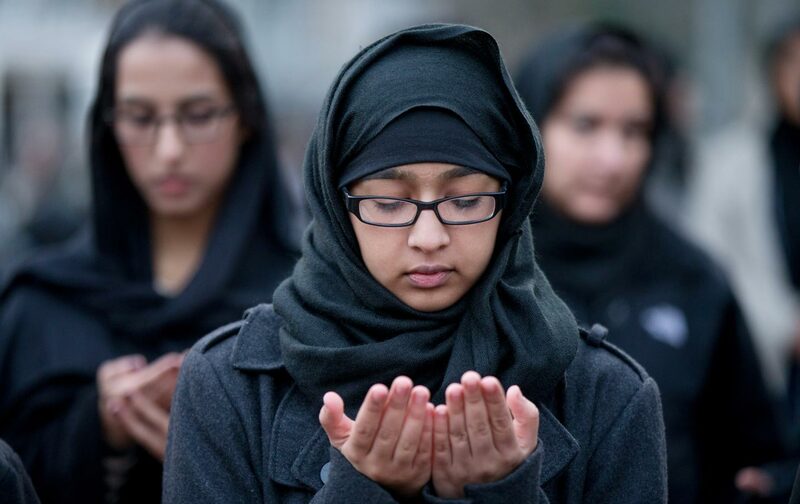 The reality is that Islam’s 1.5 billion adherents around the world are highly diverse. And America’s Muslim community may offer the best evidence that Islam isn’t inherently violent, and doesn’t drive significant numbers of Muslims to terrorism in the absence of other social, economic or political problems. American Muslims have been described by The Wall Street Journal (somewhat patronizingly) as “role models” for Muslims everywhere. Almost seven in 10 Muslims identify as political moderates or liberals, according to a 2009 survey by Gallup. Multiple surveys have found that, by and large, American Muslims have an optimistic outlook on life in this country, and want to be welcomed into the mainstream. That’s likely a reflection of their success in America. Lori Peek, a Colorado State University sociologist and author of Behind the Backlash: Muslim Americans After 9/11, told Reuters that studies have found that Muslim immigrants have been among the most successful at integrating into our society. They value education, participate in our politics, and tend to live in diverse communities. It’s believed that America’s Muslim community is the wealthiest in the world. According to Pew, 45 percent report making at least $30,000 per year, a higher share than the 36 percent of Americans as a whole. They report owning a business or being self-employed at a higher rate than the general population. Forty percent of Muslim Americans hold a college degree—compared with 29 percent of the population as a whole—and according to Gallup, one in three have a professional job. Muslim women are among the most educated in the country— second only to Jewish women—and work outside the home at the same rate as Muslim men. The gender gap in pay among American Muslims is smaller than that of any other religious group. Muslim Americans face a steady drumbeat of accusations that they’re a fifth column for terrorist organizations. That’s the logic behind Donald Trump’s outlandish proposal to bar entry of all Muslims into the country, including US citizens who traveled abroad. But do the math. There are somewhere between 3 million and 7 million Muslim Americans in this country. Last week, Syed Rizwan Farook became the 23rd American Muslim to carry out a terror attack in the United States since 9/11. Most of those attacks were unsophisticated—they included one committed with a hatchet and another with an automobile. Over those 14 years, these incidents, heinous as they were, resulted in 64 deaths. That’s 64 out of well over 200,000 murders in the United States during the same period. More than twice as many Americans died in mass shootings in 2014 alone. According to a database maintained by New America, a DC-based think tank, there have been almost three times as many deadly attacks perpetrated by non-Muslim, homegrown extremists of various stripes over that same period. A study by UNC Chapel Hill sociologist Charles Kurzman found that, through the end of 2014, another 230 or so Muslims have been implicated in terrorism in some way. But a majority of them were planning to go abroad to join groups like ISIS. (To put that in perspective, it’s estimated that around 3,000 people have made that journey from the European Union over the past few years.) In total, 112 Muslim Americans have been identified as plotting attacks in the United States since 9/11, including Syed Farook. That’s about eight per year, from within a population of millions. And according to Kurzman, “Two-thirds of the domestic plots were disrupted early, with weapons or explosives provided by undercover agents or informants.” Civil libertarians charge that many of those plots were cases in which law enforcement entrapped troubled young people who didn’t know what they were doing. The context here is important. For years, American Muslims have been told by many Christians—and Jews and “new atheist” types—that Islam is incompatible with Western democracy. Last month, the American Values Survey found that 76 percent of Republicans believe Islam to be “incompatible with the American way of life,” despite the fact that Islam has been part of the fabric of this country since before its founding. At the same time, they’ve been told by Islamic fundamentalists that democracy is incompatible with Islam. And they might well have come to believe that given the discrimination they suffer and the toxic Islamophobia they often see around them. They might have accepted the idea that the West is at war with Islam when we invaded and occupied Afghanistan and Iraq—after all, experts say the invasion of Iraq provided an enormous boost to terrorist groups’ recruitment efforts. And yet with a few scattered exceptions, Muslim Americans have proved both the Islamophobes and the Islamic extremists wrong. With a few scattered exceptions, Muslim Americans have proved both the Islamophobes and the Islamic extremists wrong. We’re lucky that’s the case. This country has hundreds of thousands of “soft targets”—shopping malls and sporting events and concerts and nightclubs where people gather in large numbers. Getting one’s hands on a gun is easy, even for those on the federal government’s terror watch-list. Instructions for building DIY explosive devices are just a click away on the Internet. If we had a “radicalized” community that was prone to terrorism, we’d be facing frequent terror attacks. But the truth is that you’re far more likely to be struck dead by lightning than killed by terrorists here at home. The inescapable conclusion to all of this—the only thing that fits the facts—is that Islam poses no problem when its adherents enjoy a modicum of prosperity in a pluralistic society with decent governance. That means that Islam is not a problem—some other factor, or factors, must be fueling Islamic terrorism in countries where it’s a significant threat. We’re very fortunate that the Islamophobes are wrong. With as many as seven million American Muslims and around 300 million guns in private hands, bloodbaths like last week’s massacre in San Bernardino would be routine if they were right. So let’s take a moment to be thankful for America’s highly successful Muslim community.